Ships dock right at the New Port. They typically offer free interport shuttles to the passenger terminal of Corfu, the distance however is only 5 to 10 minutes on foot, depending where you are docked. Some ships will also operate shuttles to and from Corfu Town, around 8 euro. Taxi charge 10 euro each way. So, with more in your party, take a taxi. The terminal has car rental kiosks and a large duty-free shop. You have to exit the terminal to find taxis (typically the first queue is for passengers looking for island tours; you have to walk way down to the end to find those cars that'll take shorter rides. 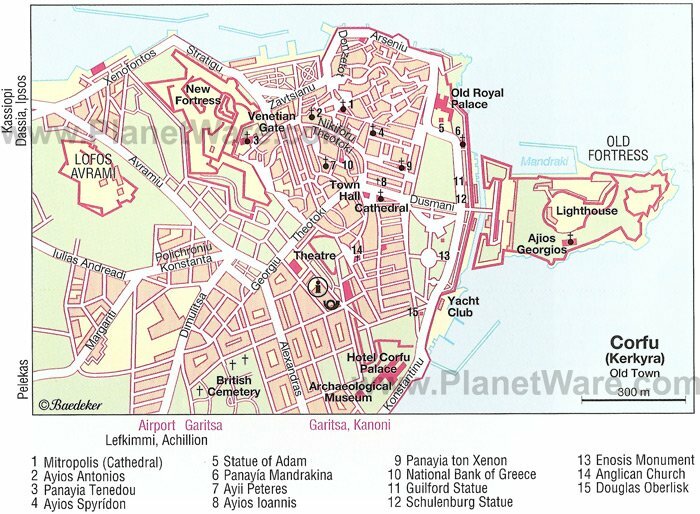 However, it is about a 20 to 30 minute or 3 km walk into Corfu if you would rather walk it. Simply leave the terminal to your left and stay right along the ocean all the way. If you are planning to use other city busses, you can buy a day ticket for only 5 Euro. Corfu town, especially in its oldest part, is one of the most charming and romantic places of the modern Greece. A perfect example of ancient Venetian and Byzantine art that will be able to fascinate you with it secret little streets and its panoramic points. Surrounded by the sea, the old town of Kerkyra is closed in by two ancient fortresses. In Corfu you can use a very good bus service that can bring you to all the most important villages (Paleokastritsa, Kavos, Ipsos, Sidari, Gouvia, Kassiopi, Roda, etc...) leaving always from Kerkyra town. Also the taxi service is well organized, however be ready to negotiate. It's also very easy to take for rent bicycle, motorbikes, car and jeeps everywhere around Corfù. Dasia beach is developed along the village, so it's long and narrow. In this part of the coast the sea is calm and from the bay you have a stunning view over Albanian mountains and coastline. Along the small streets of the old town hundreds of small local shops are one next to the other and here you can really find everything you're looking for. In Corfu there are also many jewelry shops, leather shops and local laboratories that work the olive wood to make souvenirs. Moreover you can find carpets, hand made table clothes and ceramic gifts. Something very special that is the symbol of Corfu island is the Kum Quat, something you must try at least once during your stay in Corfu. In the cruise terminal there is free WiFi. Service slows down when many crew members are using it. As crew members have to be on board an half hour before the passengers this might be a good time frame to connect.